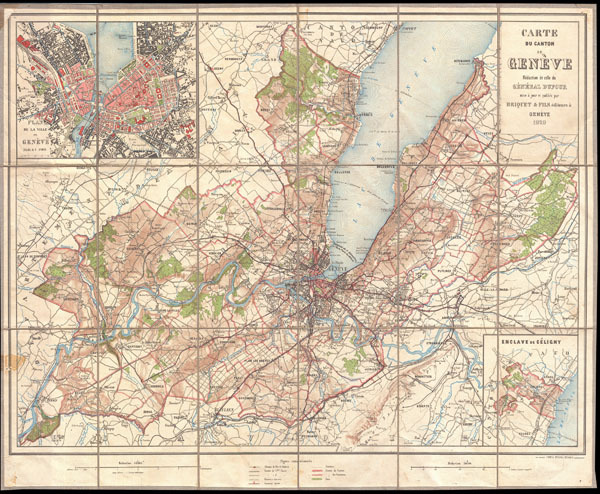 A rare 1929 pocket issue map of the Canton du Geneve or the Canton of Geneva. Covers they city of Geneva, Switzerland, as well as much of the surrounding area and a significant part of Lake Geneva. Extends northward as far as Coppet, southward as far as St. Julien, westward to chancy, and eastward to Moniaz. There are insets of the city of Geneva as well as the Enclave de Celigny. This map is a reduction the Geneva sheet from the much large 25 sheet map of Switzerland made by under the supervision General Dufour in the 1868. Published by Briquet & Fils. Briquet & Fils (fl. 1840 - 1940) were Geneva based publishers active in the late 19th and early 20th century. The firm's corpus includes numerous maps, postcards, travel guide, prints and books. They also published as B. & F.
Very good condition. Minor area of tape damage in the lower left quadrant. Else clean. Dissected and mounted on linen in 18 sections.